The Brush tool is used to draw and sketch on vector and bitmap layers. The Brush tool is pressure sensitive and lets you create a contour shape with a thick and thin line effect, as if the drawing was made with a brush. For tasks related to this tool, see About Drawing Tools and About the Brush Tool. In the Tools toolbar, click the Brush button. 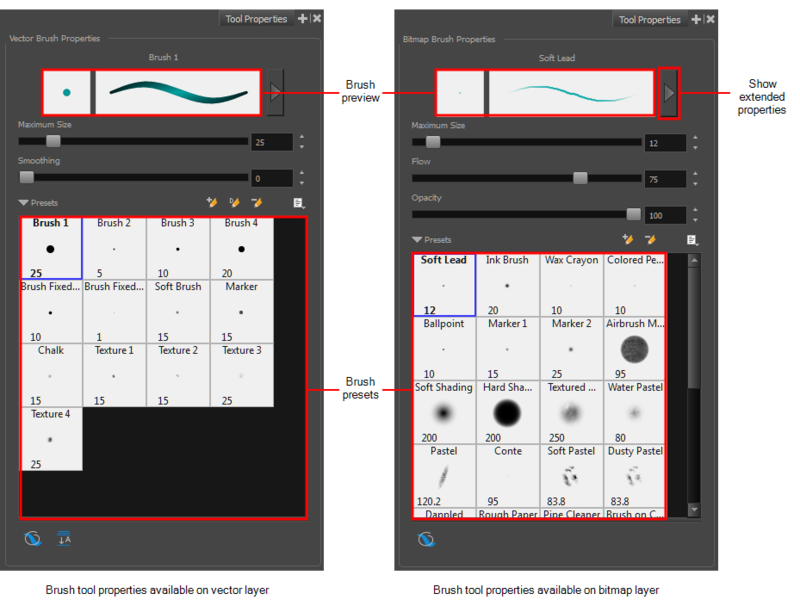 Displays a preview of the selected brush. Opens the Brush Properties window. Defines the maximum width of the line. Lets you set the range for the rate at which paint flows from the brush. The analogy works better with a pen. The greater the flow, the more ink comes out, which gives you a more consistent line colour and texture. If the flow is light, then the colour and texture of the line may look spotty. The flow works with the pressure sensitivity of a pen tablet. Lets you you set the transparency for a brush stroke. This works with the pressure sensitivity of a pen tablet. On vector layers, defines the number of control points added to the centre line. Displays the presets available which depend on the type of layer you select. Lets you create a new brush preset. Lets you create a brush that contains a pattern you want to repeat in a drawing on a vector layer—see Using the Dynamic Brush. Deletes the currently selected brush. Lets you access commands for create brush presets, deleting and renaming brushes, importing and exporting brushes, and setting the brush preset display. When drawing on vector layers, the Draw Behind mode lets you paint behind existing art. By default, strokes appear over your work until you release the tool. If you want a live preview of your stroke, activate the Realistic Preview option by selecting View > Realistic Preview. Merges objects and brush strokes into a single layer.